Mary is an excellent model of cooperating with the Holy Spirit. Charismatic renewal and traditional Catholic teaching work together to help increase our love the Holy Spirit by learning from Mary's example. In the Bible, Mary's life is filled with the Holy Spirit. That shows us an example of how our lives can also overflow with the Holy Spirit's presence and activity, which impacts others. The following are some examples from the Bible where Mary and the Holy Spirit are together at key moments in the life of Christ and the early Church. 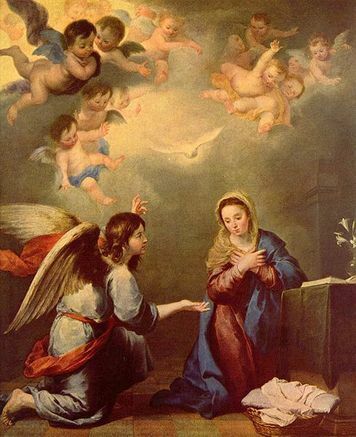 When the angel presented to Mary God's plan for her in the world's salvation by giving birth to the Savior, she said yes, and she received the Holy Spirit. Filled with the Holy Spirit and the joy of God's revelation for her life, she visited her cousin Elizabeth, and she was so overflowing with joy and God's presence, that the unborn St. John the Baptist could feel it as he too rejoiced while in Elizabeth's womb. When Mary gave birth to Jesus, angels came out of Heaven with the gift of praise and worship. When Mary brought Jesus into the world, He drew diverse people from near and far to worship Him, as poor local shepherds, and rich kings from the east, came to worship Him. When Jesus was presented in the Temple as a baby, Simeon, through the gift of prophecy, proclaimed that Jesus was the Messiah, and that Mary would have a profound role in His life Luke 2:25-35, "The Holy Spirit was upon him. It had been revealed to him by the holy Spirit that he should not see death before he had seen the Messiah of the Lord. He came in the Spirit into the temple; and when the parents brought in the child Jesus to perform the custom of the law in regard to him, he took him into his arms and blessed God, saying: "Now, Master, you may let your servant go in peace, according to your word, for my eyes have seen your salvation, which you prepared in sight of all the peoples, light for revelation to the Gentiles, and glory for your people Israel." The child's father and mother were amazed at what was said about him; and Simeon blessed them and said to Mary his mother, "Behold, this child is destined for the fall and rise of many in Israel, and to be a sign that will be contradicted (and you yourself a sword will pierce) so that the thoughts of many hearts may be revealed." Also in the Temple, the prophetess Anna, showed how the Holy Spirit moves one to praise God and to proclaim the Good News, "she gave thanks to God and spoke about the child to all who were awaiting the redemption of Jerusalem" (Luke 2:38). One of Mary's greatest roles is to direct people to Jesus. At the wedding at Cana in John chapter 2, Mary does two significant things that point us to Jesus. While Mary does not say much, what she does say speaks volumes. The Bible shows how Mary goes to Jesus with needs that arise, and how she points people to Jesus. At Mary's request, Jesus did His first miracle at the wedding at Cana. Her request was a prayer that we can imitate, simply bringing to Jesus a need, in this case, "They have no wine" (John 2:3). Her words to the servers advise them to be obedient to Jesus, which is an example that everyone should learn to make a part of daily life. John 2:5 records this interaction saying, "His mother said to the servers, 'Do whatever He tells you." "In order that the submission of our faith should be in accordance with reason, it was God's will that there should be linked to the internal assistance of the Holy Spirit external indications of his revelation, that is to say divine acts, and first and foremost miracles and prophecies, which clearly demonstrating as they do the omnipotence and infinite knowledge of God, are the most certain signs of revelation and are suited to the understanding of all. Hence Moses and the prophets, and especially Christ our Lord himself, worked many absolutely clear miracles and delivered prophecies; while of the apostles we read: And they went forth and preached every, while the Lord worked with them and confirmed the message by the signs that attended it (Mark 16:20)." - First Vatican Council, Dogmatic Constitution on the Catholic Faith, Chapter 3, paragraphs 4 and 5. 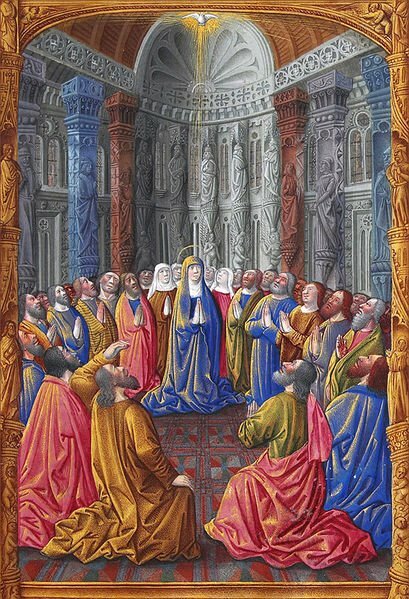 The Birth of the Church on Pentecost In Acts 1:14, the Bible singles out Mary as being present with the early Christians as they prayed for the Holy Spirit after Jesus' Ascension. After fervent prayer, together with Mary as the Bible points out, the Holy Spirit came upon the Church and ever since has empowered Christians to spread the Gospel all over the world. Acts 1:14, 2:2-4 "All these devoted themselves with one accord to prayer, together with some women, and Mary the mother of Jesus... When the time for Pentecost was fulfilled, they were all in one place together. And suddenly there came from the sky a noise like a strong driving wind, and it filled the entire house in which they were. Then there appeared to them tongues as of fire, which parted and came to rest on each one of them. And they were all filled with the holy Spirit and began to speak in different tongues, as the Spirit enabled them to proclaim." Mary, Spouse of the Holy Spirit Because Jesus was conceived by the Holy Spirit and Mary (Luke 1:35), her relationship to the Holy Spirit can be thought of in a mystical way similar to that of a spouse. Pope Leo XIII wrote about this in the encyclical, Divinum Illud Munus, On the Holy Spirit, in 1897, saying, "Let all Christian peoples add their prayers also, invoking the powerful and ever-acceptable intercession of the Blessed Virgin. You know well the intimate and wonderful relations existing between her and the Holy Ghost, so that she is justly called His Spouse. The intercession of the Blessed Virgin was of great avail both in the mystery of the Incarnation and in the coming of the Holy Ghost upon the Apostles. May she continue to strengthen our prayers with her suffrages, that, in the midst of all the stress and trouble of the nations, those divine prodigies may be happily revived by the Holy Ghost, which were foretold in the words of David: "Send forth Thy Spirit and they shall be created, and Thou shalt renew the face of the earth."